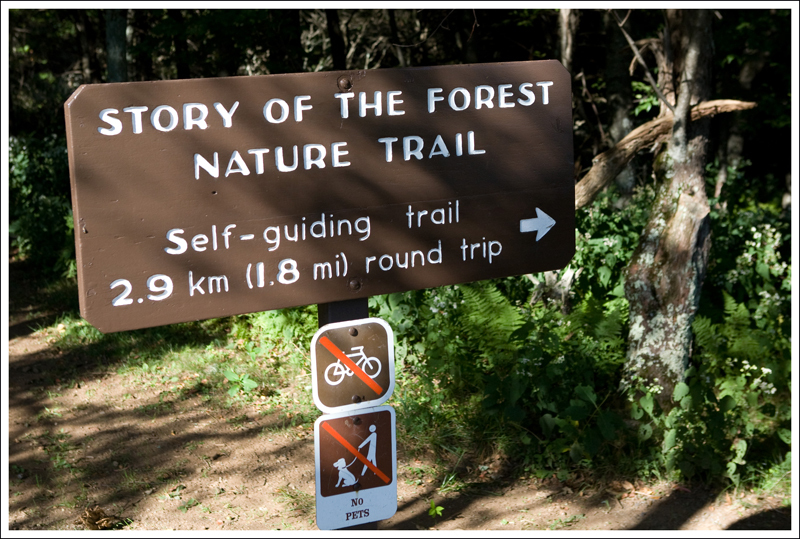 The Story of the Forest Trail is an easy family walk in the Big Meadows area of Shenandoah National Park. The entire loop is 1.8 miles and half of the trail is paved. 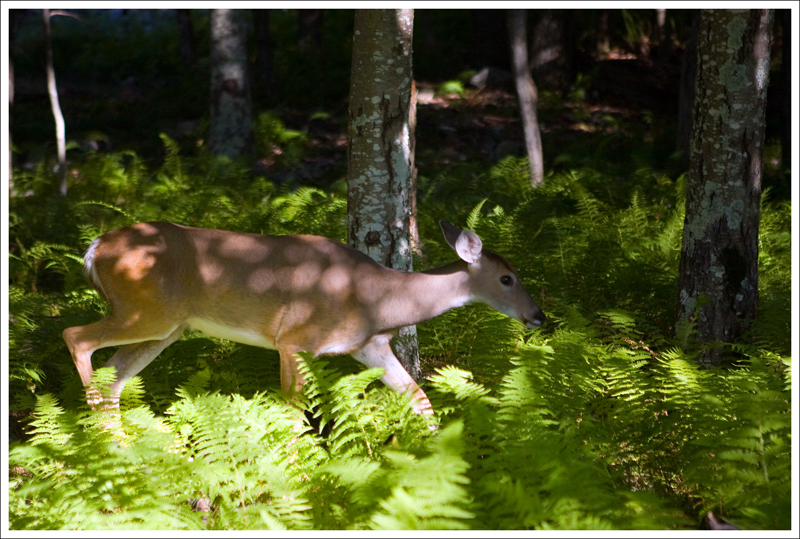 Whitetail Deer are a common sight along the Story of the Forest Trail. Below: No pets or bikes are allowed on the trail; The return arm of the loop follows a paved path along the road. The first weekend of September was spectacular – simply perfect weather to be outside. Adam and I decided to take a picnic dinner up to the park. The Big Meadows area has a 1.8-mile nature trail, called “Story of the Forest”, that joins the wayside and the campground. We decided that a pleasant pre-dinner stroll sounded ideal. We parked at the Byrd Visitor’s Center, and set out from the north end of the lot. The trailhead is marked by a sign that also indicates that dogs and bikes are prohibited on this path. 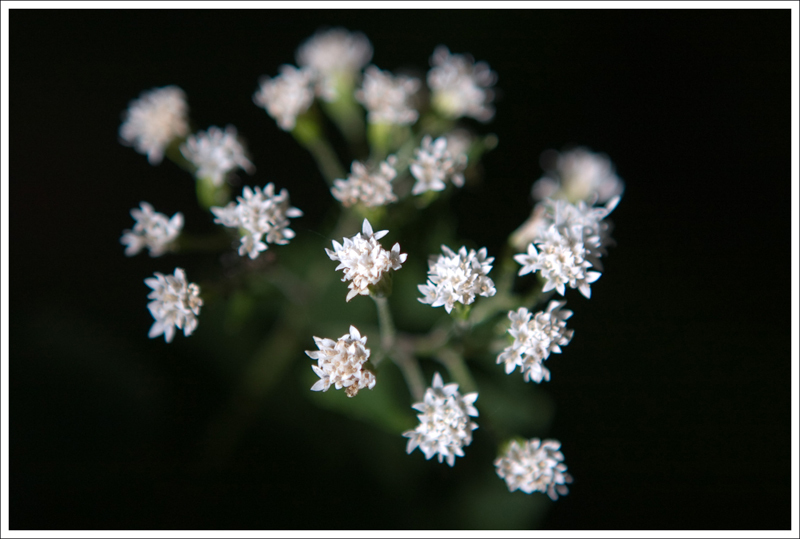 The trail was lined with these small white wildflowers. 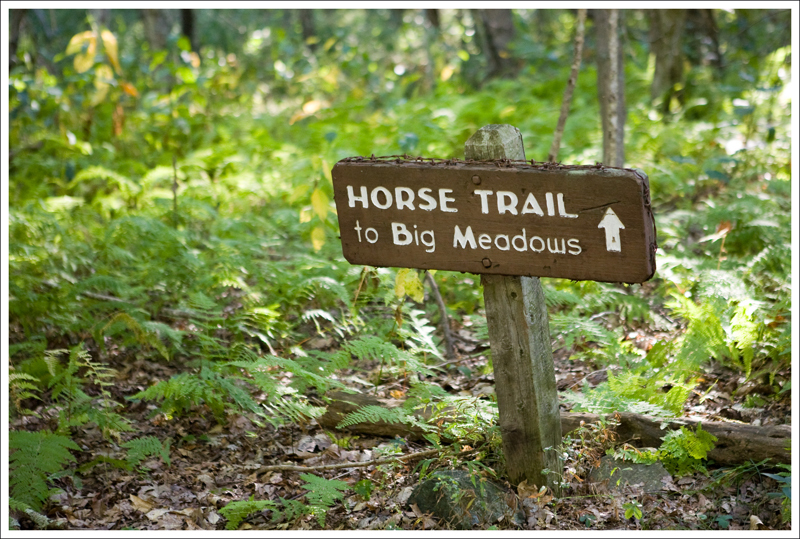 Below: The Big Meadows-Skyland horse trail crosses the path. 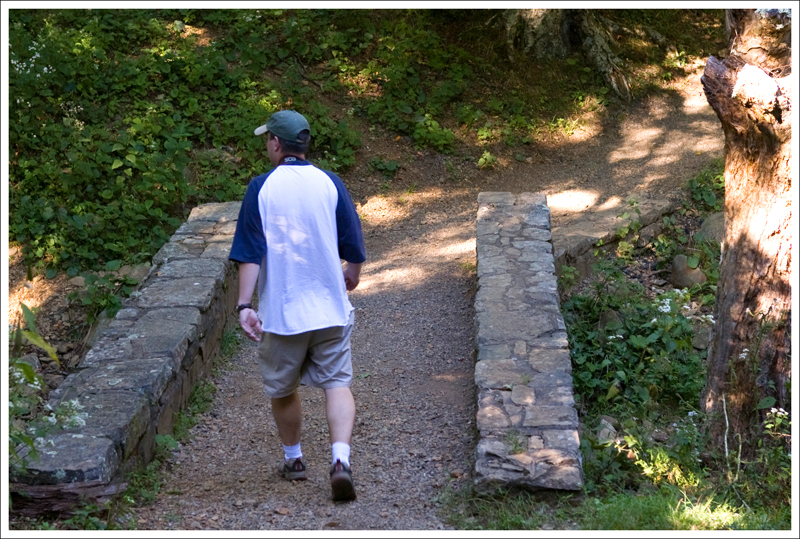 The trail starts off gently downhill – passing through an area lush with ferns and wildflowers. After crossing a small footbridge over a stream that feeds Dark Hollow Falls, the trail bears left and heads deeper into the woods. You’ll pass over the Big Meadows-Skyland horse trail. After that, you’ll pass communication towers that are part of the lodging complex. Eventually, the campground will come into view. To make the hike into a loop, turn left when you see the campground. This will lead you back out to a paved bike path running parallel to the road through Big Meadows. 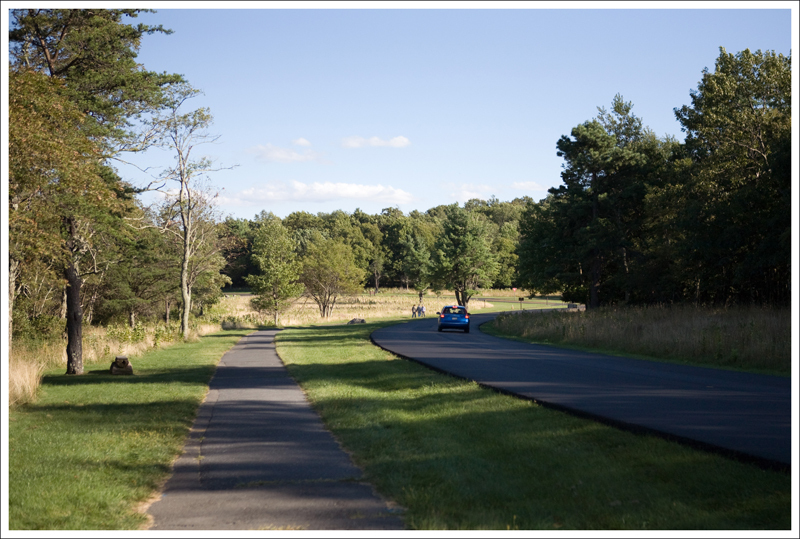 The paved path will lead you back to the wayside and visitor’s center. The Story of the Forest doesn’t offer anything especially unique , but it is a nice walk for anyone visiting the Big Meadows area. I think this was actually the first time I have done the Story of the Forest Trail. It is a very easy hike, so it is perfect for families with small children. You can also use this trail to connect to Dark Hollow Falls to create a longer hike. The trail is a nice walk in the woods, passing by some impressive trees and ferns. I was expecting a guide that would possibly tell the “story of the forest”, but there isn’t a hike brochure like there is at the Stony Man Trail. There are a few turns that form this loop. The trail is marked on the cement posts as “nature trail”. Once you start the trail, you will go through the forest until you reach a couple of bridges that go over the Hogcamp Branch. In .2 miles, take a left at the junction to stay on the trail. In .4 miles, the trail will intersect with a horse trail – just go straight and don’t turn on the horse trail. In .8 miles, you will begin to see the Big Meadows campground. Take a left on the paved path to follow this back to the Big Meadows wayside, which is next to the Visitor Center. Grab a blackberry shake from the wayside and take a picture with the CCC statue at the visitor center to round out the experience. This small footbridge crosses a stream that feeds Dark Hollow Falls. 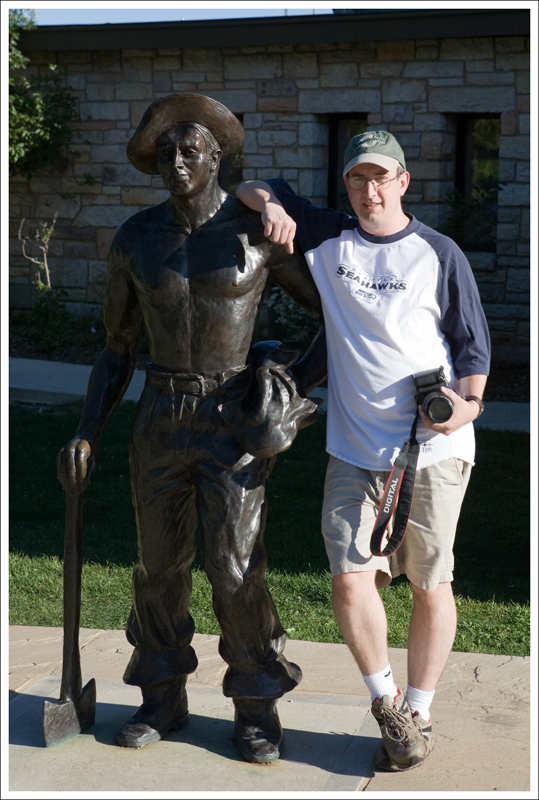 Below: When you pass the visitor’s center near the end of the loop, stop to pose with the CCC statue. I’m surprised that Christine didn’t tell the story, but we passed a family that were slowly making their way along the trail. A girl hoisted on the shoulders of her father was soooo excited to see a deer. She said to us as we passed, “Take a picture of the deer.” We went a little further up the trail and saw a different deer. I stopped to take some pictures and the deer wasn’t being cooperative. When the deer got startled and bolted off, I said a curse word. I heard far off through the woods, the same girl say, “That man said a bad word.” I felt bad about that and Christine hasn’t let me live it down. I like to think that I was reinforcing her education rather than being a bad influence. If she hadn’t heard the word before, she wouldn’t know it was bad. At least that’s how I’m trying to justify it. Difficulty – 1. This trail is suitable for everyone. Trail Conditions –4.5. The trail is very well-graded and easy to walk on. The return arm of the loop is a paved bike path. Waterfalls/streams – .5. In wet weather, you’ll cross a small stream that feeds Dark Hollow Falls. Wildlife –3. There should be plenty of deer. Many folks have also spotted bears on this trail. Ease to Navigate –4. Easy to follow, just look for the Nature Trail marked on cement posts. Solitude –1. You’ll see many people on this trail, as it connects the Big Meadows campground to the wayside and visitor’s center. Park at Big Meadows near the Harry S. Byrd Sr. Visitor Center (mile 51 on Skyline Drive). The trailhead starts across from the northern end of the Visitor Center parking lot. That being said, it is a nice brief loop. Great pics as always! Thanks for understanding Andrew. Christine just smiled, shook her head, and said, “That’s my husband.” Not having kids sometimes shows that my filter for these things isn’t always on.